Frank Hutchison was born 1897 in Raleigh County, West Virginia; some sources quote 20th March 1897 as his date of birth. Soon after 1897 the Hutchison family moved to Logan County, West Virginia, a location commemorated by Hutchison’s classic guitar solo Logan County Blues. 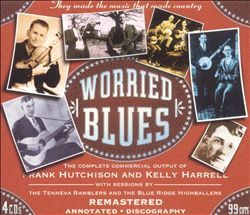 Prior to his musical and recording career Frank Hutchison had worked as a miner and according to a fellow Logan County musician, had a limp – one assumes this may have been due to an accident while working in the mines. He also worked at times as a cook, carpenter and general handyman. Photos show a serious looking man but by all accounts he was very friendly and an outgoing character. According to Ernest Stoneman, Hutchison was ”a big red-headed Irishman”, one who evidently had plenty of fun in him. With regard to Hutchison’s contributions to the field of early country music (or if you prefer the term otm), it has to be said he was not only an innovative while country blues man but also someone who had a few ‘extra cards up his sleeve’ as compared to some of his contemporaries. Apart from his distinctive voice, albeit a trifle rough one, Frank Hutchison’s guitar playing was innovative, particularly in his use of the slide guitar on some of his recordings. In September 1926 he travelled to New York to make his first recordings for the Okeh company with whom he would remain for his three-year recording career. The two sides he cut were made using the acoustic method of recording, as distinct from the electrical process that would eventually consign the earlier method to the history books. In fact it appears that when Hutchison re-recorded these two numbers they may have been the first Okeh issues to use the then new electrical recording system. It seems obvious that the label must have been satisfied with the sales of his initial recordings because Frank Hutchison was called back for a 1927 date that provided nine fine performances. A two-day session in April produced five numbers, including the re-makes of Hutchison’s first two sides. Apart from them, two items are worthy of mention; The Last Scene of The Titanic is, as a song, a unique version about the Titanic disaster; an event that had occured fifteen years earlier but was still very much in the mind of the general public and record buyers. Hutchison’s version difters from all the many other ‘Titanic’ songs recorded by both black and white performers. The other piece of interest is Logan County Blues, a variation on the tune Spanish Fandango; it is played in open tuning and is a Hutchison ‘piece-de-resistance’. His picking makes the listener think it is a simple guitar solo – any would-be guitar player will tell you otherwise!